The Catechism of the Catholic Church teaches us that, "[T]he existence of the spiritual, non-corporeal beings that Sacred Scripture usually calls "angels" is a truth of faith. The witness of Scripture is as clear as the unanimity of Tradition." The name of the archangel Michael means, in Hebrew, who is like unto God? and he is also known as "the prince of the heavenly host." He is usually pictured as a strong warrior, dressed in armor and wearing sandals. His name appears in Scripture four times, twice in the Book of Daniel, and once each in the Epistle of St. Jude and the Book of Revelation. From Revelation we learn of the battle in heaven, with St. Michael and his angels combatting Lucifer and the other fallen angels (or devils). We invoke St. Michael to help us in our fight against Satan; to rescue souls from Satan, especially at the hour of death; to be the champion of the Jews in the Old Testament and now Christians; and to bring souls to judgment. This day is referred to as "Michaelmas" in many countries and is also one of the harvest feast days. In England this is one of the "quarter days", which was marked by hiring servants, electing magistrates, and beginning of legal and university terms. This day also marks the opening of the deer and other large game hunting season. In some parts of Europe, especially Germany, Denmark, and Austria, a special wine called "Saint Michael's Love" (Michelsminne) is drunk on this day. The foods for this day vary depending on nationality. In the British Isles, for example, goose was the traditional meal for Michaelmas, eaten for prosperity, France has waffles or Gaufres and the traditional fare in Scotland used to be St. Michael's Bannock (Struan Micheil) — a large, scone-like cake. In Italy, gnocchi is the traditional fare. Patron: Against temptations; against powers of evil; artists; bakers; bankers; battle; boatmen; cemeteries; coopers; endangered children; dying; Emergency Medical Technicians; fencing; grocers; hatmakers; holy death; knights; mariners; mountaineers; paramedics; paratroopers; police officers; radiologists; sailors; the sick; security forces; soldiers; against storms at sea; swordsmiths; those in need of protection; Brussels, Belgium; Caltanissett, Sicily; Cornwall, England; Diocese of Pensacola-Tallahassee Florida; England; Germany; Archdiocese of Mobile, Alabama; Papua, New Guinea; Puebla, Mexico; San Miguel de Allende, Mexico; Sibenik, Croatia; Archdiocese of Seattle, Washington; Diocese of Springfield, Massachusetts. This is a good feast to learn more about the angels. Children especially are fascinated by these celestial beings. The best place to start is the Catechism of the Catholic Church, nos. 328-336 to see the teachings of the Church on angels. John Paul II also did a Catechesis on the Angels during his General Audiences from July 9 to August 20, 1986. 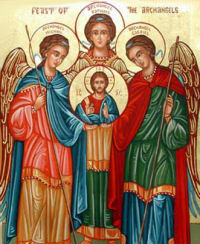 Find the passages in the Bible about angels, in particular the passages about Michael, Gabriel and Raphael. Read the section on angels in the Directory on Popular Piety and Liturgy. The document examines the doctrine and devotions of the angels. Devotion to angels is good, but also can have deviations. an attitude of devotion deriving from the knowledge of living constantly in the presence of the Holy Angels of God — serenity and confidence in facing difficult situations, since the Lord guides and protects the faithful in the way of justice through the ministry of His Holy Angels. Among the prayers to the Guardian Angels the Angele Dei is especially popular, and is often recited by families at morning and evening prayers, or at the recitation of the Angelus. Also read All About the Angels. Memorize the prayer to St. Michael the Archangel. Although no longer formally recited after Mass, our Holy Father John Paul II has encouraged us to recite this prayer daily. Read about this prayer. Here is the Regina Caeli message from April 24, 1994 during which the pope encouraged this prayer. In honor of St. Gabriel, Learn the Angelus and recite it daily. Traditionally, the prayer is prayed at the 6:00 and 12:00 hours (am and pm). There is a partial indulgence attached to those who pray this prayer. Read the Book of Tobit for the story of St. Raphael helping Tobit and Tobias. Make some recipes related to Michaelmas. Of special mention is the St. Michael Bannock from Scotland, roast goose and stuffing from Britain, waffles from France, and roast duck from Germany or France, gnocchi from Italy. Blackberries, apples and carrots also play a large role on this feast in various countries. Other ideas: make an angel food cake, devil's food cake or angel hair pasta. Decorate with white, symbolizing the angels, or use other symbolic colors (see above). Non-dessert items: deviled eggs, deviled meats, etc. Try to find the Michaelmas daisy, a purple aster, to use for decoration. It also comes in other colors, including white, but purple is the most popular. It usually blooms in late summer until October. The official name is Aster novi-belgii, but is also known as New York aster. If you find plants or seeds to plan for next year's garden. This site has photos and gardening information for the Michaelmas daisy. If you have access to blackberries, make this the last picking and eating. Perhaps make a blackberry pie? See Michaelmas Pie for a great recipe.